Hey guys its me RYO-CHAN!, whats up, hey, this is my new wall, the vector was made by chloe-chan, and this took me weeks to do, i use a dark blue and light blue background, and put clouds up and put texture on the girl too, and i've also put the sunlight rays to shine down on the girl to show her way back to her home and to her friends, meaning i'm coming back to you guys soon!, i'll be back soon you guys, please please take care, i had live without internet for 3 months now, please take care, WUB YOU! looks really good and i can tell you worked hard! +fav! fantastic wall.I never watched Air but I love the art. Chloe-chan did an awesome job on the vector. But more than that, I love the meaning behind it. I haven't been around MT since New Year so...I'm trying to come back full time too. Hope to talk to ya soon! 3 months, no internet?! Oh my...hope you come back real soon! I love this scan so much! You did a great job with the sky and clouds! Those sparkles are a nice touch! Whoa! Do you have the internet back yet?! Come back soon! Anyway, you know what I think about this! OMG ryo-chan i missed badly! and such a nice wall chu! Really nice o.o.... almost everything blends in perfectly =). 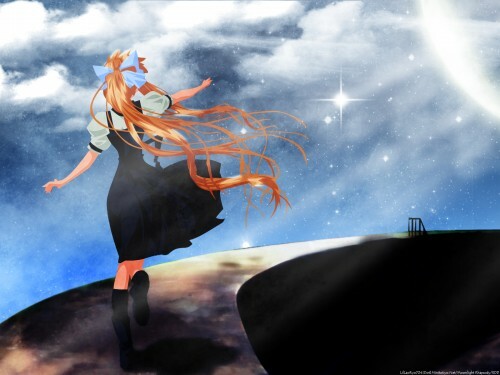 Fly Misuzu and walk forward! your background is so pretty! What a nice design! I'd give it an 8/10 (you could work on the resolution and the directional flow). Otherwise, great job. This is definitely going next on my screen. This is definitely becoming one of my wallpapers!